Inside Stanley’s Northeast Bar Room, all looked normal. Patrons sipped beer and watched TV. Bartenders went about their business. 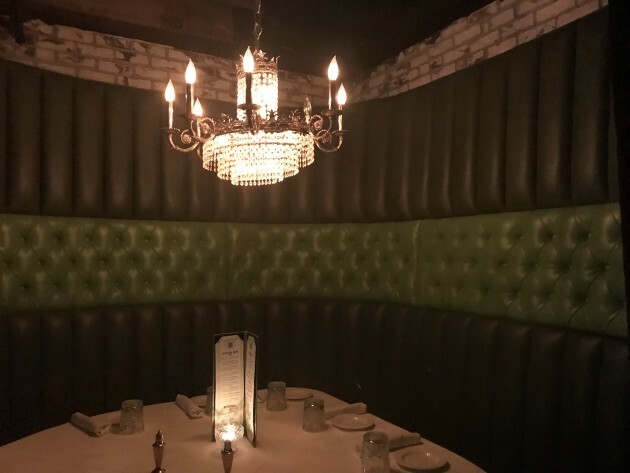 I’d heard — first in trickles through the grapevine, then via a PR person who reached out to me, seemingly ruining the point of all this — about a secret cocktail room hidden upstairs. The entrance was concealed too: in an innocent-looking photo booth in the bar’s rear. We opened the curtains and stumbled around, trying to figure out what to do next. A peep hole in the back “wall” of the booth hinted to something amiss, though I’m not sure I would have noticed if I hadn’t already been tipped off. A man in a vest, tie, jacket and newsboy cap opened the wall — a door!! — and stared at us. “Yes?” he inquired, his face expressionless. “Um, there’s two of us,” I said. “Well, what are you doing back here?” my friend Liz asked. “We run a furniture shop upstairs,” he explained. Got it. It’s a “furniture shop.” Sure. “And I really need a new sofa,” I added. “We don’t have those,” Newsboy Cap Guy said. “What do you have?” Liz asked. Newsboy Cap Guy let us pass, and we leapt up the wooden stairwell, on a mission to purchase a set or two of hand-crafted, super tasty bar stools. As we climbed, steams of smoke flitting down the stairs began to envelop our feet. Everything was starting to get fuzzy and we hadn’t even consumed any of those cocktails — errrr bar stools — yet. When we reached the top, a smiling woman in a sequins-laden dress greeted us. We looked around a darkened room, filled with smoke — from an unseen smoke machine, not cigarettes, though it mimicked that bygone era. The haze obscured the details, making the attic-like room — boasting a white-tablecloth dining area and a bustling bar — seem dreamlike. 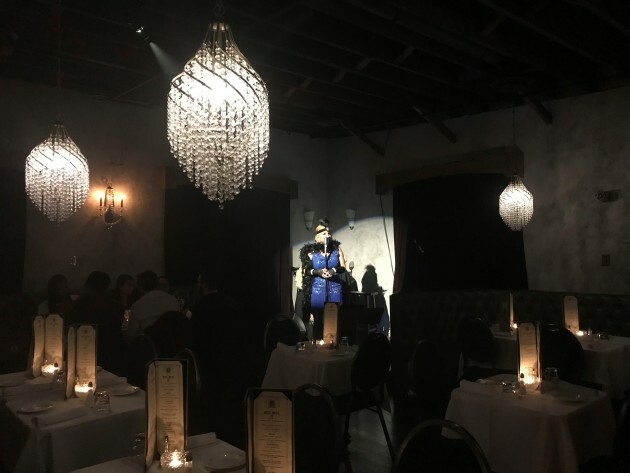 Jazz played; soon, a woman in full flapper getup would sing Ella Fitzgerald and more under a single spotlight. We sat down at the counter, and the bartenders introduced themselves — Hoover and Doctor Sunshine. We were handed a “Captain’s List” of cocktails – drinks prepared tableside with premium spirits, for the hefty price of $35. 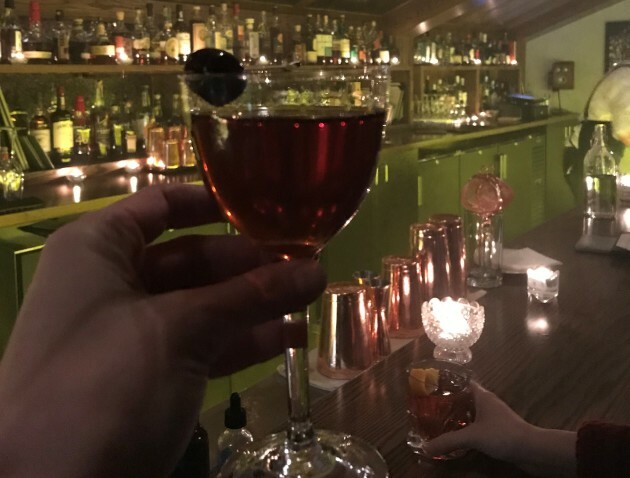 But we turned our gaze to the regular, more realistically priced cocktail list instead — because isn’t sitting at the bar and watching bartenders the same experience as having drinks made tableside?? I ordered a Manhattan, and Liz, an Old Fashioned. Both were nicknamed — Mattress and Ottoman, respectively. There was also a “Sofa” strawberry sour, by the way, which made me want to inform Newsboy Cap Guy that I was going to get my desired home decor after all. We shared an antipasto plate, one of a handful of dishes on a decidedly old-school Italian menu. After a couple hours passed, just like a dream, we decided to come back for our bar stool sets another day. It seemed like a lot to carry. And we left, as instructed, through a different exit than the entrance from which we had come, down another stairwell that dumped us back into the street, into northeast Minneapolis and reality. “It’s safer that way,” Newsboy Cap Guy had told us. Especially since we didn’t have our furniture packages. We looked around. Coast clear. No one eyeing us suspiciously. No one questioning our shopping trip.